‘World of Warcraft’ Mists of Pandaria Expansion Launches September 25, 2012!!! Land, ho! Blizzard Entertainment, Inc. today announced that World of Warcraft®: Mists of Pandaria™, the fourth expansion set for the world’s most popular subscription-based massively multiplayer online role-playing game, will be available in stores and online starting from September 25, 2012. Upon the expansion’s release, intrepid explorers of the Alliance and the Horde will be able to set foot upon the shores of the long-lost continent of Pandaria and embark on a perilous journey to uncover its ancient mysteries. Mists of Pandaria will be available on DVD-ROM for Windows® XP/Windows Vista®/Windows® 7 and Macintosh® at a suggested retail price of $39.99 USD. The expansion will also be available digitally directly from Blizzard’s World of Warcraft website (www.WorldofWarcraft.com), also priced at $39.99 USD. A special Collector’s Edition packed with bonus items will be available exclusively in retail stores for a suggested retail price of $79.99 USD. 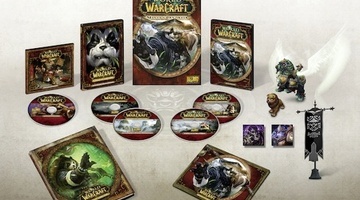 In addition, for the first time, World of Warcraft players have the option to purchase a special Digital Deluxe version of the expansion containing the in-game bonus items from the Collector’s Edition. The Digital Deluxe version is available to download directly from Blizzard via www.WorldofWarcraft.com for $59.99 USD. Players who purchase the standard edition digitally or at retail will have the option to upgrade to the Digital Deluxe version at any time (for as long as the standalone Digital Deluxe version remains available) for an additional $20 USD. Presales for the standard digital and Digital Deluxe versions of Mists of Pandaria are now live. Players who would like to purchase either version and be ready to play the moment the expansion launches can do so now by visiting www.WorldofWarcraft.com. The expansion content will automatically be digitally delivered to pre-purchasers via World of Warcraft’s streaming launcher prior to the release ofMists of Pandaria. Players who would like to preorder the standard box or the retail-exclusive Collector’s Edition can do so by visiting their local retailer. Mists of Pandaria has received a Teen rating from the ESRB. In addition to the English version, Mists of Pandaria will be fully localized into Latin American Spanish, Brazilian Portuguese, French, German, European Spanish, Russian, Korean, Traditional Chinese, and for the first time with a World of Warcraftexpansion launch, Italian. Availability of Mists of Pandaria in mainland China will be announced at a later date. The ‘World of Warcraft’ Movie Will Be Directed By….. This entry was posted on Thursday, July 26th, 2012 at 9:36 am	and is filed under News, Video Games. You can follow any responses to this entry through the RSS 2.0 feed. You can skip to the end and leave a response. Pinging is currently not allowed. « ‘Mad Men’ Season 5 Bluray Announced and Detailed!! !